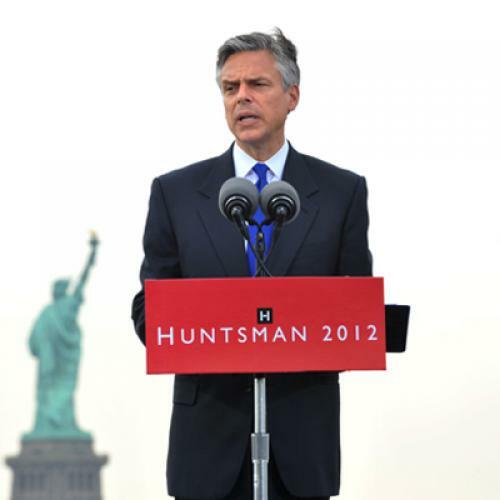 Jon Huntsman at Liberty Park: The Next Wesley Clark? Jersey City, New Jersey—With his voice firm as he disdained a Teleprompter for a printed speech text, with the shock of prematurely white hair at his temples giving him statesmanlike gravity, with the Statue of Liberty looming over his left shoulder in an advanceman’s fantasy (inspiration provided by the late Michael Deaver, Ronald Reagan’s imagemaker), 51-year-old Jon Huntsman declared his candidacy for president Tuesday less than two months after he stepped down as Barack Obama’s ambassador to China. The reason for dwelling on Huntsman’s anodyne rhetoric is because his presidential campaign remains curiously inchoate. I am perplexed whether there is more—or less—to Huntsman’s political persona than meets the eye. It is tempting to see a mature moderation in Huntsman’s seeming reluctance to embrace tax cuts as the cure for all national ailments from crab grass to middle seats in coach. Despite an overt Reagan homage in his announcement speech, Huntsman limited himself to a single ambiguous line about the Republican Party’s transcendent cause: “We must make broad and bold changes to our tax code and regulatory policies.” But does this restraint really signal a centrist policy orientation or does it simply reflect that this former ambassador has not yet had the time to develop a tax-cut plan? Such old-fashioned political manners matter to a constituency that counts—the candidate’s mother. Talking with a vigorous Karen Huntsman after the speech, she said, “I feel pride. But I also feel at peace that he can bring civility to the presidential campaign.” These Emily Post values are also apt to play well in the primary that is central to Huntsman’s presidential dreams—New Hampshire, the state that launched McCain in 2000 and resurrected him in 2008. According to the 2008 New Hampshire primary exit polls, 81 percent of GOP voters attended college, 75 percent had family incomes over $50,000, and just 21 percent described themselves as “very conservative.” If anything, with Barack Obama running unopposed, the 2012 New Hampshire Republican electorate will be even more centrist since there will be little incentive for independents to vote in the Democratic primary. Political railbirds face an occupational hazard in over-analyzing Huntsman’s presidential prospects since a national poll by the Pew Research Center last month found that only 35 percent of GOP voters recognized his name. For all of his blue-chip fund-raising support, for all the eagerness of the press pack to anoint him as a top-tier contender, for all the nervousness in the Obama White House about his candidacy, Huntsman remains an unproven political commodity being rushed into the test markets of the primaries. The obvious parallel is not Henry Cabot Lodge, LBJ’s ambassador to Vietnam, who won the 1964 New Hampshire primary on a write-in vote. Rather it is Wesley Clark, who pole-vaulted into the 2004 Democratic race based on elite dissatisfaction with the other contenders and never found a way to offer voters more than his star-spangled resume. Before Huntsman spoke in the shadow of the Statue of Liberty, his campaign ran a slick biopic video filled with the kind of focus-grouped lines that might describe a generic GOP candidate: “The ultimate conservative … forever pro-life … What does it take to never flip, never flop? … Prefers a greasy spoon to a linen tablecloth … Not in it for the balloons … No drama. Progress. This guy is different.” (On the Huntsman campaign website, which is still hard to locate via Google, I found an analogous but somewhat longer biographical video). As the only Republican in the race with serious foreign-policy experience (as opposed to, say, running the Winter Olympics), Huntsman has the potential to forge new ground in the slow-starting GOP ideas primary. As a personable contender who is likely to boast ample campaign cash even though he has said he will not self-fund, Huntsman will get his chance to be heard amid the GOP cacophony. But what will he say and how will it resonate with Republican audiences? Even as he becomes the latest surprise entry in the 2012 GOP field, Huntsman currently remains a riddle wrapped in a mystery inside an enigma. Walter Shapiro is a special correspondent for The New Republic. Follow him on Twitter (lucky you).